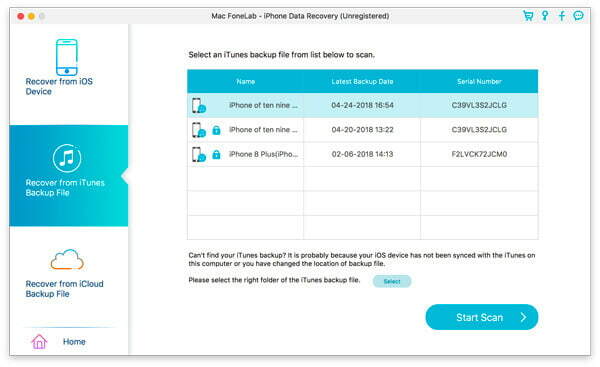 Mac FoneLab is the most reliable iPhone, iPad & iPod Touch data recovery software for Mac by helping you recover the lost or deleted data due to jailbreak, iOS upgrade, etc. 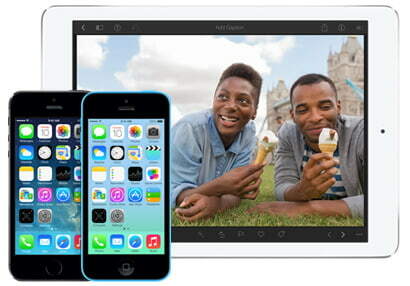 from iTunes and iOS devices directly. 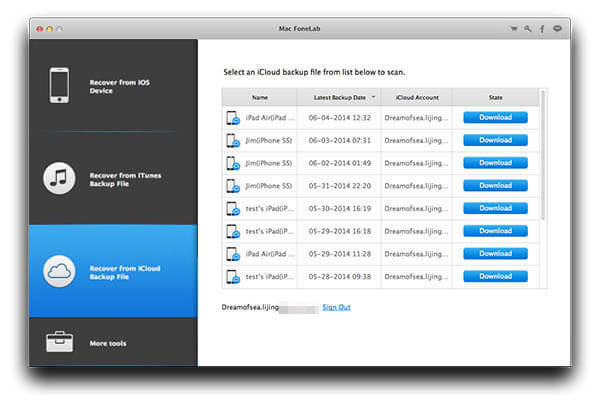 ▶ Restore lost data from iCloud backup files quickly New! After testing Mac FoneLab millions of times, we guarantee this software is no harm to your iOS devices and data. 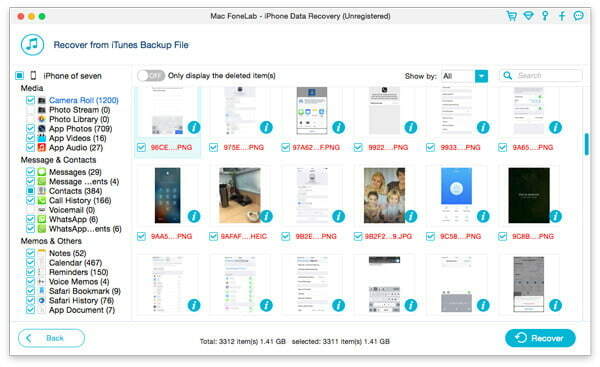 Retrieve lost files including Contacts, Messages, Call history, Calendar, Notes, Reminder, Safari bookmark and other important data for your iPhone 5s/5c/5/4S, iPad 4/3/2/Air, iPad mini/mini 2 and iPod touch 5. 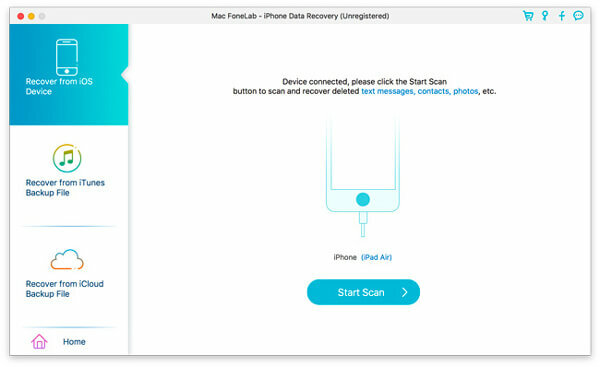 Connect your device to your Mac, and FoneLab will help you get back your lost or deleted data in great speed even your device is locked or caught with other problems. All the required data could be scanned and exported. Recover the lost and backup the existing information just in case. 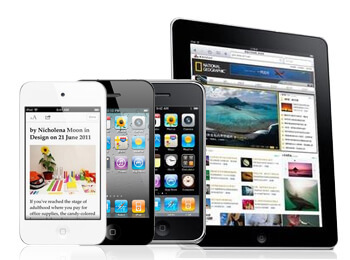 FoneLab helps you to find your lost data due to your careless operation on your 4/3GS, iPad 1 and iPod touch 4. It supports getting back most of file types, including Contacts, Messages, Call history, Calendar, Notes, Reminder, Safari bookmark, etc. You can even get access to the lost/deleted and existing data from you locked device caused by password forgotten, being smashed, crashed or even broken. The recent upgrade to the program makes it possible to recover lost or deleted data on your iPhone from iCloud backup files. 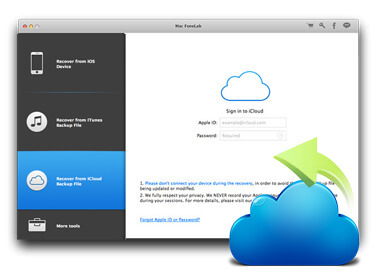 Sign in to your iCloud account, download the backup file and restore what you want. Recoverable files from iCloud including Contacts, Messages, Call History, Notes, Calendar, Reminders and Safari Bookmarks, etc. You can choose where to save the recovered files and open them freely as they are saved into supported formats on your Mac. The powerful preview function makes it possible to see the specific contents, Photos, time, name, etc. of your SMS, call history before recovery. You'll find all scanned files displayed in the preview window in category. Both the lost and existing files are visible. Just click the file type and see the detailed information. Exportable text content include Contacts, Messages, Call history, Calendar, Notes, Reminder and Safari bookmark while media contents include Camera Roll, Photo Library, Photo Stream, Message Attachments and Voice Memos. Mac FoneLab provides users with the best solution of recovering the lost or deleted Contacts, Messages, Call history, Calendar, Notes, Reminder, etc. directly from iOS devices or just the iTunes backup. 1. 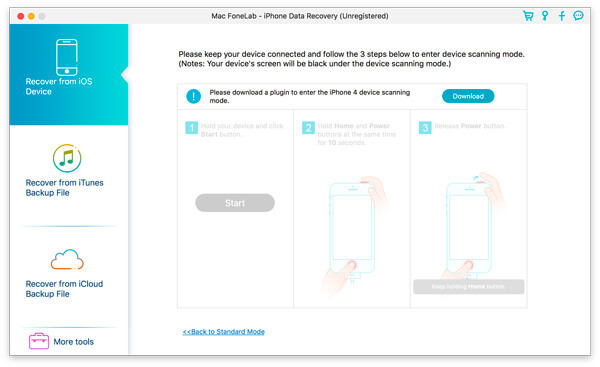 Select "Recover from iOS Device" mode and connect your device. Once detected, the current device name will be displayed on the interface of program. 2. Select the one which you want to restore to scan. 3. Click "Start Scan" button to begin scanning your device for deleted data on it. 4. Select the files you want to regain, click "Recover" to get back and save your data in local disk. Step 1. 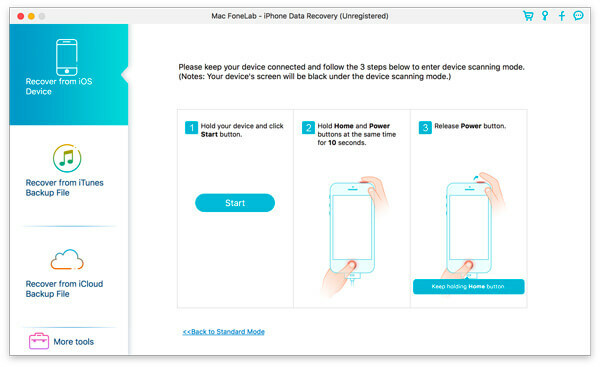 Select "Recover from iOS Device" mode and connect your device to your computer. Step 2. Please click "Download" to download and install the corresponding plug-in according to the prompt before scanning your device. Step 3. After installing the plug-in, please follow the three steps below to enter scanning mode. 3. Release Power button and keep holding Home button for another 10 seconds. After the scan, you can preview all data found on your device in the scan result. The category and number of files will be listed in the left sidebar and the specific content will be displayed on the right panel. You can double-click on a photo to view it. 4. Select the files you want to retrieve, click "Recover" to regain and save your data in local disk. 5. Click "Exit Scanning Mode" button or directly close the software to launch your device into normal mode. 1. 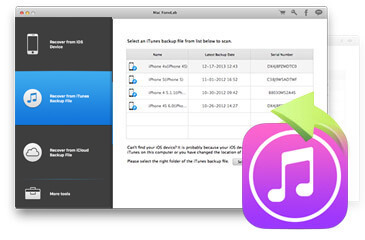 Select "Recover from iTunes Backup File" mode. 2. Select the backup file you want to recover from and then click "Start Scan" to enter into scanning mode. 3. After the scan, you can preview all data found on your device in the scan result. The category and number of files will be listed in the left sidebar and the specific content will be displayed on the right panel. You can double-click on a photo to view it. 1. 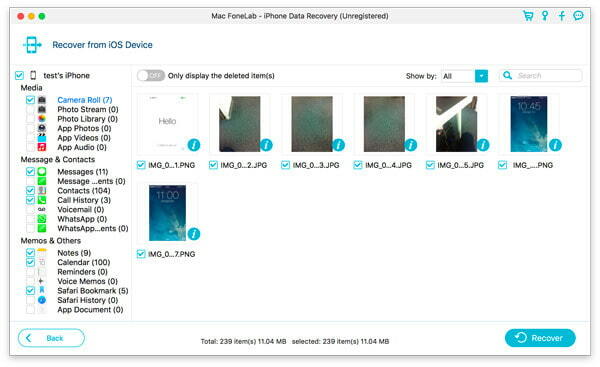 Choose Recover from iCloud Backup File. 2. Sign in to your iCloud account. All the backup files in the account will be listed. Choose the one you need and click Download. 3. Wait patiently until it is downloaded. The download process may be long or short. It depends on the file size and the network speed. 4. After that, do the same as the above two methods. Choose the file and click Recover.